A fresh wave of global risk aversion and the ongoing slide in the US yields contributed to Gold prices breaking above the $1200 level. A positive sentiment on the back of the new NAFTA deal has triggered the move alongside the growing concerns over Italy's budget plans that kept investors on their edge and was seen as one of the key factors driving flows towards traditional safe-haven assets. Gold continued to gain momentum during yesterday's session as it broke above the $1200 level all the way up till the $1208 level. 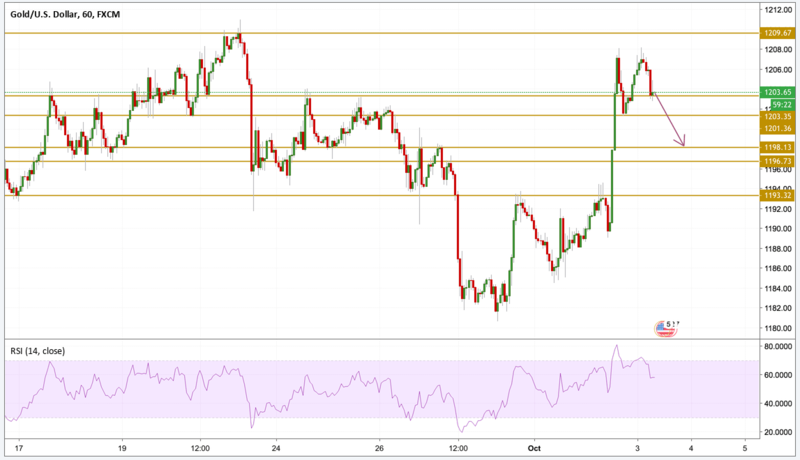 The price is currently hovering just above the 1203.5 level but a divergence has been seen on the chart with the price forming a double top pattern and the momentum showed a decrease on each top. That points toward an upcoming downward move and the level to watch is $1198.15.